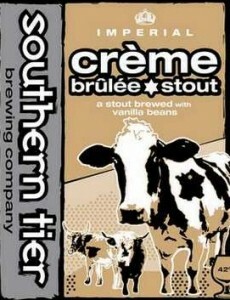 The Aleheads have discussed Southern Tier on this site before. They make some excellent and interesting brews, and I generally give them the benefit of the doubt when it comes to selecting a beer. So last night, when I found myself faced with a daunting variety of beer at one of my local watering holes, I noticed that they had a “Creme Brulee Stout” on tap. Being a fan of both Southern Tier and stouts, I figured what the heck and ordered myself one. What I found was one of the most interesting and perplexing beers I’ve had in quite some time. The Creme Brulee Stout is perhaps the most aptly named beer I have ever tasted. It poured a dark black with a caramel colored head that last for a few minutes. The nose is incredible. I don’t necessarily mean “incredible” in a good way, but rather in a hard-to-believe kinda way. I’ve had chocolate stouts. I’ve had espresso stouts. I’ve had blueberry beer, apricot beer, raspberry beer. I’ve had beer aged in wine barrels, beer aged in whisky barrels. All of these beers pick up the scent of what they’re trying to be, to varying degrees. However, I have NEVER had a beer that smells exactly like what it purports to be, until now. This beer smelled like someone took a dish of creme brulee and blended it up and poured it into a 12 oz. goblet. It smelled like caramel and vanilla and sweetness. I felt like I should be attacking it with a fork. Do you like creme brulee? * You will like the smell of this beer. *Note: This question was, of course, rhetorical. If you do not like creme brulee, you are most likely a Communist. The taste is a different issue. When you taste it, it tastes… well, it tastes exactly like it smells. Huge vanilla and caramel flavors — like someone meant to roofie you and dosed you with vanilla extract instead. There’s a slight maltiness in the aftertaste, but really this beer has no bitterness at all. There is a burn from the alcohol, though. Whatever it smells and tastes like, the Creme Brulee is no wussy beer. With an ABV of 10%, it’s impossible to hide all of that burn. Frankly, the alcohol tinge is probably a good thing, as it cuts the extraordinary sweetness of the beer. The mouthfeel of the beer is perfectly stout-ish. It definitely coats the mouth, but I didn’t find it to be cloying or overpowering. On the whole, I have a tough time rating this beer. I really, truly enjoyed the first third of it. The second third of it I found myself looking at the bar’s IPA list for my next beer. The last third of it was nearly undrinkable due to the extreme sweetness of the beer. This beer has a staggeringly low drinkability factor in my opinion (and this is coming from someone who has repeatedly claimed that drinkability is his number one factor when judging whether or not he like a beer). I think if you had asked me after my first few sips, I would have said it was a 3.5 hop beer. If you had asked me immediately following the last sip, I probably would’ve given it 2 hops. So, I’m going to split the difference and round up, giving the beer a little extra credit for challenging my tastebuds. 3 hops. I definitely recommend trying this beer, but I would also recommend having someone else around to keep you from overdosing on it. Posted in Tasting Notes.Tagged Beers That Taste Like Food, Milk Stout, Southern Tier, Valhalla. I 100% with your review. I too reviewed this and found the 2nd half UNDRINKABLE. The vanilla to me was the worst part of this brew. Just way to over the top. The sweetness too was overpowering! When I saw the heading, I was like “MILK STOUT?… Yick!” Guess I was right. Too weird for my palate.Very good review. I actually really like the Blackwater Series from Southern Tier. I admit it’s a little disconcerting when the beer tastes EXACTLY like what the name implies (the Mokah in particular tastes like a coffee milkshake), but I think there’s something honestly refreshing about the big, bold natures of those brews. Sometimes I’m in the mood for a true dessert beer…and there simply aren’t any better ones out there than Southern Tier’s Blackwater brews. Just make sure you have your insulin pump ready to rock before you start drinking. I like most of the other Blackwater beers, but this is the one that I just can’t drink. It’s just…too…sweet. Aptly named, indeed. This is probably the richest beer I’ve ever had.